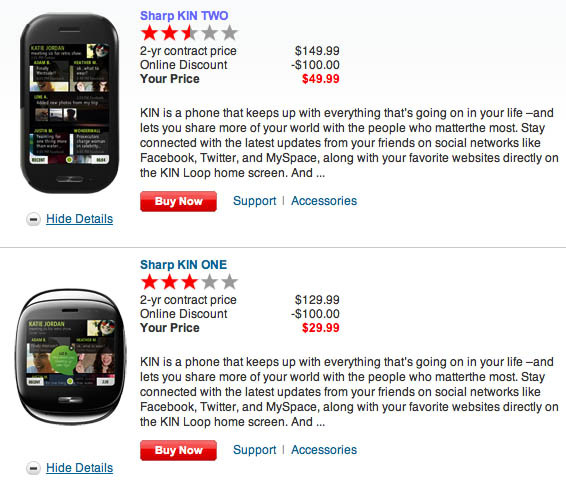 Verizon has slashed the prices of Microsoft's ill-conceived and ill-received not-so-smartphones with the Dr. Seussian names of Kin One and Kin Two. Just six weeks after release, the biscuit-shaped Kin One now costs a mere $29.99 with a two-year plan and a side-sliding Kin Two, $49.99. At those prices, may we suggest that it would make more sense for Verizon to simply give the poor things away — it might at least then make a few bucks on wireless charges. Both phones — manufactured by Sharp — have had brief but rough lives since they were announced in mid-April and released in mid-May. Although their marketeers tried hard to position them as hot'n'hip social-networking must-haves, reviewers mostly yawned at their feature sets, grumbled over their software, and scratched their heads in disbelief when they learned that third-party apps were barred from the devices. The nail in what increasingly appears to be the Kins' co-coffin was pricing. Although the narrowly targeted phones were designed for "download generation" kids, they were (originally) priced for adults. Then Verizon pounded a few more into the pine box by offering the Kins with full-priced voice and data plans — the same fees that Verizon charges for real smartphones, not toys. The Kins also suffered from rumors of dismal sales — including one unsubstantiated rumor cited by Business Insider that lowballed total Kin sales at a mere 500. As we said, that's pure rumor — but if it turned out to be true, few would be astonished.